Music production workshops and lessons delivered by Just Add will enable young people to create their own original music, interviews, songs and documentaries. 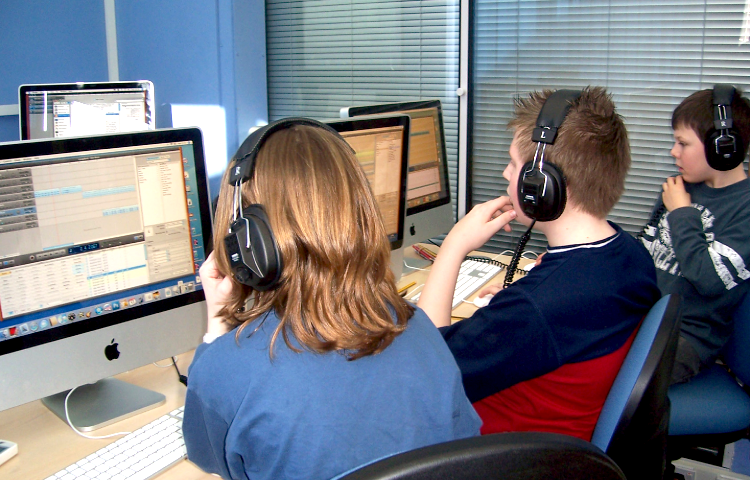 In these activities children and young people will learn how to use music production software to compose, arrange and mix, whilst having fun. All workshops are interactive and allow participants to learn whilst they explore music and instrumentation. Our creative practitioners will teach participants about music and composition covering aspects of the music GCSE syllabus. Lessons start from 2 hours, however longer projects can explore other music or media applications and show participants how to use the full potential of a range of music software packages. We can design music workshops/lessons around your timetable, as PPA or an afterschool club. Are aimed at helping people of all ages to understand and appreciate media through practical activity. Just Add work is learner-centred, providing significant opportunities for the children and young people involved to take a lead and develop their own ideas, skills and experience, whilst challenging attitudes and expectations. The participants decide on a theme for their podcast and this can be anything from a school or class project to pop music. The content can range from local community news, stories and interviews to music, jingles, drama and sporting reviews. This work supports the development of basic skills such as literacy and numeracy, and key skills such as team working, listening and speaking and problem solving. This project is designed to be flexible in meeting the different needs of a diverse group of learners. Apply ICT to real-world situations when solving problems and carrying out a range of tasks and enquiries. With over 15 years of delivering DJ skills lessons and projects, Just Add can work with you to create bespoke activities suited for primary schools, secondary schools, PRUs, youth clubs, youth offending institutions and organisations working with children and young people. We can deliver an assembly, session/s as part of culture day/s or a tailor made project such as producing music for a dance piece, school play or community performance. DJing is a great way to get young people interested in new music genres; it teaches problem solving and thinking skills and improves self-confidence and self-esteem. Our From Disks 2 Digital assembly is designed as a demonstration of skills used in DJing and the transition from analogue music technology like vinyl records to digital MP3’s. Our creative practitioners are all professional DJs that have years of experience working in a teaching environment and they will start by explaining the history of DJ’ing and the vinyl record. Some young people will never have seen a record as they were born in the digital era. The demonstration will go on to show how the advent of CDs and MP3s have changed technology and given DJs more versatility in the way they mix and present music. DJ Skills workshops and lessons are a fantastic introduction to musical exploration. We provide the equipment and the opportunity for children and young people to be creative, adventurous and express themselves using music technology. DJ workshops can be run as drop in sessions, a lesson designed to fit in with your school day or as part of a GCSE music course. Our creative practitioners will teach participants how to mix and scratch, they will learn about rhythm, beat matching and the importance of tempo when mixing tracks. In our experience, DJ’ing has proved very effective at engaging challenging and disaffected young people. DJ Projects can be tailored to have a range of creative outcomes that can be used as part of a larger performance or project. For example pupils could create a mix of music for a dance performance or backing music in a school or other performance. We can design DJ workshops/lessons around your timetable, as PPA or an afterschool club. Pupils will learn about tempo, listening with attention to detail and appreciating recorded music from different traditions.